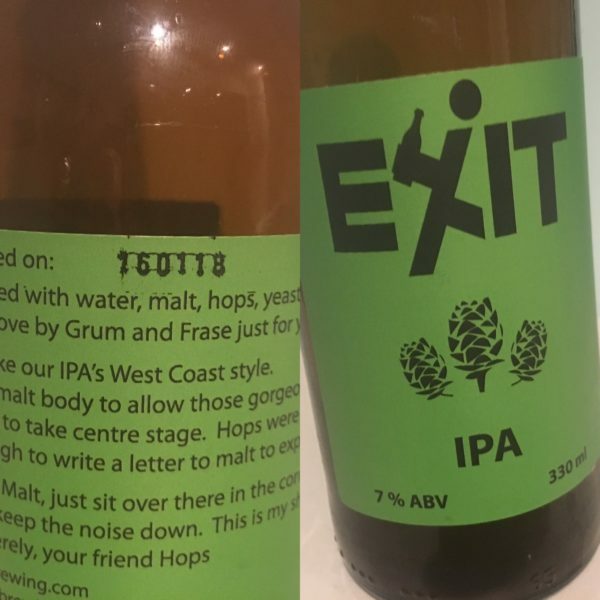 ‘Hops take the stage’ with this Exit Brewing IPA. Interestingly, there’s a Belgian abbey style tripel element to the nose here which I can’t quite pin-down. It’s almost an aldehyde character, though I’m sure some brewing types would be better placed to explain. Mix in caramel richness and a little funk plus the nettle hops and you’ve got plenty going on. It tastes more like an imperial IPA in many ways, though without the warmth, completed with toasty malt to finish and handy bitterness. Good stuff, though doesn’t quite have the presence to be a superstar. I liked it though, and has some complexity. Worth trying again. 4 stars. 7%. Brewed on 160118 (yes! The future! See photo below). 7%. Would I buy it again? Yes, though not a multi-buy.